Original unplayed stock copies of Dyke and the Blazers "Funky Broadway Pt. I"/ "Funky Broadway Pt. 2" on Original Sound OS-64. Has CThle but is nm. 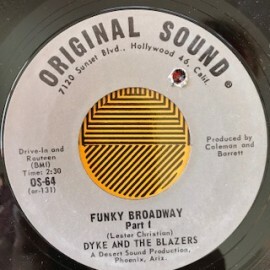 Great for DJs and fans of soul music as well as music from the state of Arizona!